Jimmy Choo Sunglasses, Highest quality prescription Rx - Eyeglasses.com since 1999. Jimmy Choo sunglasses cater to a sophisticated clientele, and the first sunglasses collection enjoyed immediate success. Jimmy Choo himself pioneered the art of celebrity dressing, bringing shoes, handbags, and recently sunglasses to Hollywood where the red carpet runway rolled out his accessories. Now, Jimmy Choo is worn by style icons, celebrities, royalty, musicians, and heads of state. The sunglasses brand’s reputation as a celebrity favorite, combined with bold and dramatic advertising, has fueled rapid expansion. 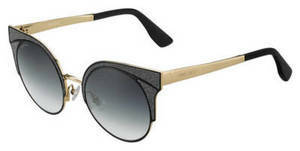 Today, Jimmy Choo sunglasses are one of a large collection of accessories. Ladies shoes remain the core of the product offer, alongside handbags, small leather goods, scarves, sunglasses, eyewear, belts, fragrance and men’s shoes. Jimmy Choo now has 167 stores in 35 countries, and can be found in the most prestigious department and specialty stores worldwide.